Let's hear it for the ladies in the house! We are powerful! We are amazing! I don't think anyone can argue with how strong women are; just look through history. Frida Kahlo, Amelia Earhart, Queen Elizabeth are just a few of the amazing females out there. We don't even have to open a history book to see the great women who stand beside us every day. They are our mothers, our sisters and our friends. Below is a sampling of cross stitch patterns from around the internet that celebrate women and all that they have accomplished. 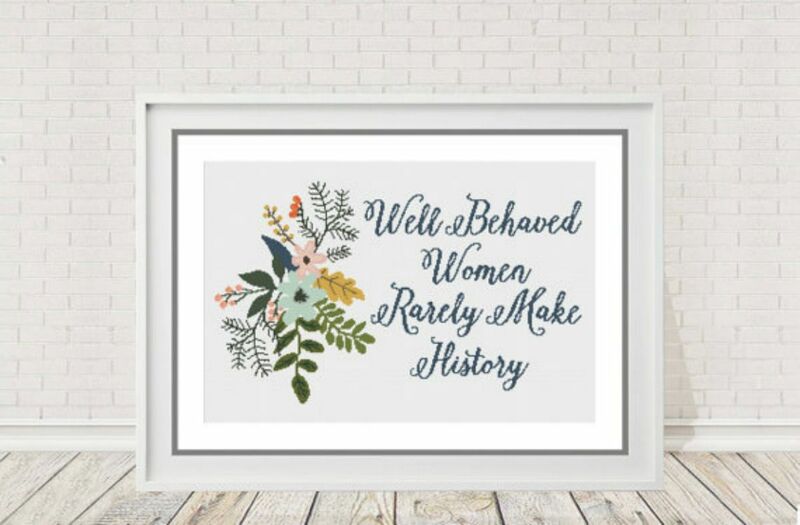 The old saying goes, "Well Behaved Women Seldom Make History." Isn't it the truth? Look at any strong woman through the ages and you will see an outlaw, a rule breaker, a sassypants. Peppermint Purple turned this great quote into a beautiful pattern. It would look amazing in an office. Have it hanging as a nice reminder. It would be the perfect gift for the woman is who graduating from school or just started a new chapter in their life. This is just one of many patterns in their Etsy shop that you can see HERE. So many people give kits a bad name. They hate them because they are "too common" Well, this kit is proving every one of them wrong. This Frida Kahlo Day of the Dead kit by GeckoRouge is just one of the many homages to Ms. Kahlo. Each pattern is as bright and poignant and Frida's paintings. There are several kit sizes and each one is made to order. You can see all the kits, patterns and other fun stuff at their shop HERE. Don't you ever tell a woman she's can't do something. She will prove you wrong and make you eat those words! Don't believe me? Check out the history on Amelia Earhart. She was constantly put down, saying she couldn't fly a plane because she was a woman. She showed them and became a celebrity in the process. Space Nona's Stitchery has probably the best patterns for celebrating strong women. This Amelia Earhart pattern is sold as a single or in a group of strong women which includes: Frida Kahlo, Wonder Woman, Rosie the Riveter, Amelia Earhart, Josephine Baker, Ada Lovelace, Sally Ride, Iris Apfel, and Queen Elizabeth. These patterns are quick to stitch up and can be found HERE. Need some inspiration? A little pick me up to help you when the going gets tough. Lucky for you, What She Said Stitches has you covered. Taking quotes from strong women in history, she creates patterns that are both beautiful and meaningful. Wouldn't it be amazing to stitch up a bunch of these patterns and frame them around a baby's room? Have them up to remind both you and her how special and precious the both of you are. You can purchase the patterns on What She Said's Etsy store HERE. Being a strong woman isn't something new. As I said before, all throughout history we have seen women rise up and show the world their strength. Female authors from every time period share their stories with us. It could be about their every day life, a fantasy world or starting a revolution. No matter what the subject is, a female author gives a unique perspective on the world. The Primitive Hare has created patterns celebrating the female writers such as Helen Beatrix Potter (who also was a natural scientist and conservationist), Jane Eyre and Louisa May Alcott. You can purchase her patterns HERE. Woman have played a vital role in shaping history and the world we live in today. Let's celebrate their triumphs and empower ourselves by stitching up a positive message and imagery. From science to literature, the female persuasion has stepped up, taken the bull by the horns and yelled, "I'm here world! Nothing is going to stop me!"